Rising over 2000 feet above Brooks River, Dumpling Mountain offers anyone a quick escape from the hustle and bustle of Brooks Camp. Each time I hike on it, I get an opportunity to see the land in a new way. 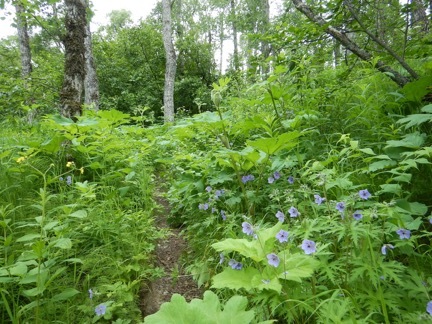 The hike begins from the Brooks Camp Campground and immediately enters a lush deciduous forest of Bebb willow, balsam poplar, and Kenai birch. The understory is filled with tall, vigorously growing grass and wildflowers. 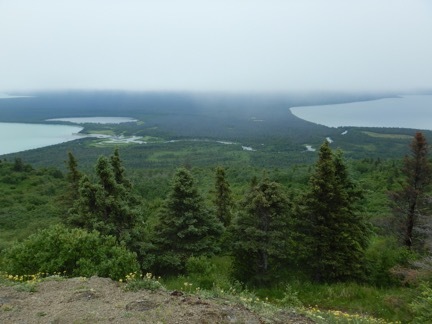 Katmai’s forests have undergone rapid changes over the past decade. 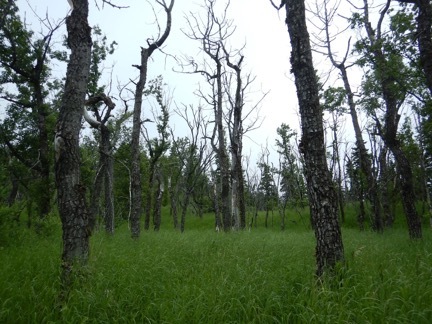 Most conspicuously, spruce bark beetles killed a significant number of trees, but an insect outbreak in 2010 and 2011 defoliated many of the trees on Dumpling’s lower slopes. The defoliation was severe enough to kill many of the mountain’s birches and poplars. Where consistent tree cover used to crown the mountainside, the canopy has opened significantly. Around a mile and half along the trail and about 800 feet higher in elevation than the trailhead, the forest opens into grassy meadows and alder thickets. 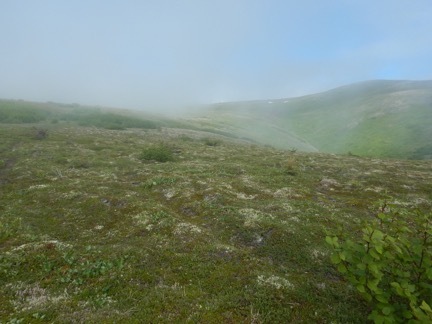 This area represents another transition on the mountain, one from forest to tundra. Timberline, the maximum elevation where tall trees can grow, is only about 1000 feet above sea level across much of Katmai. From an overlook in this transition zone, I was able to look down upon the entirety of Brooks River. 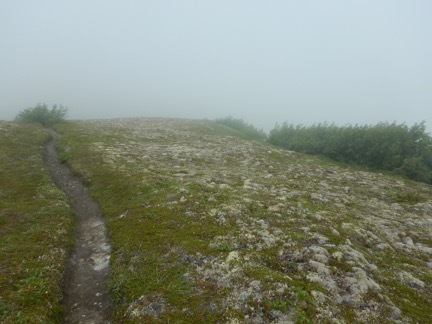 Continuing beyond the overlook on a seldom-maintained path, I entered a thick layer of fog. By obscuring the far horizon, the fog presented an opportunity to pay closer attention to my immediate surroundings. In Dumpling’s meadows, the wildflower bloom was just beginning to peak. About 1,200 to 1,500 feet above sea level, the meadows began to dwindle in size, replaced increasingly by a veneer of alpine tundra. Tundra is a product of climate. It’s a habitat community where tree growth is inhibited by cold temperatures and a short growing season. Plant diversity is relatively low due to the harsh, windswept conditions. 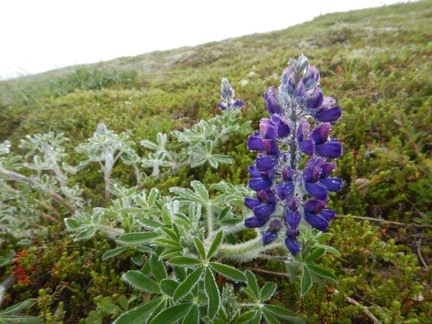 At lower elevations where the climate is more temperate, taller plants outcompete most of the tundra and alpine species, but any plant that tries to grow more than a few inches high on the tundra risks pruning from desiccating winter winds. 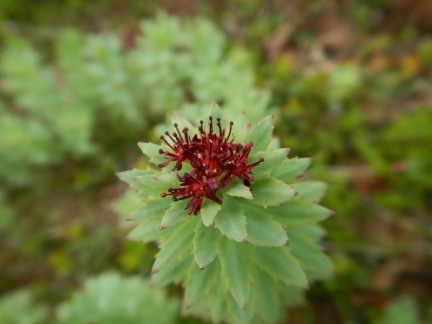 Consequently, most of the plants above 1,500 feet on the mountain are ground hugging with small leaves. 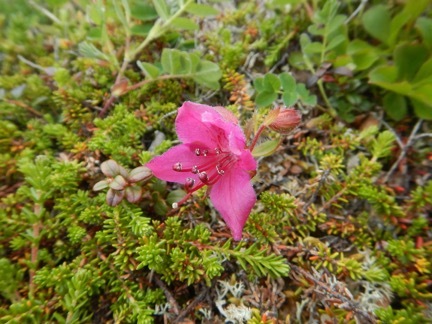 Kamchatka rhododendron (Rhododendron camtschaticum) typically growing no more than a few inches tall, splashes Dumpling’s tundra with bright magenta flowers in June and July. Like its name suggests, it’s also found in Russia’s Kamchatka Peninsula. 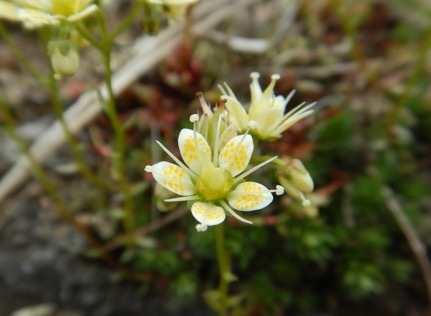 In fact, the plant is far more common across Russia and into northern Europe than it is in North America. East of Katmai, it’s found in only a few isolated pockets in Alaska. To me, it represents Katmai’s connection boreal ecosystems across Eurasia. The fog only represented a thin layer of clouds. The sky became progressively brighter as I continued onward. About 2000 feet above sea level, I began to see blue sky. Ascending just a couple of hundred feet higher, I broke out of the veil and stood on an island in a sea of clouds. 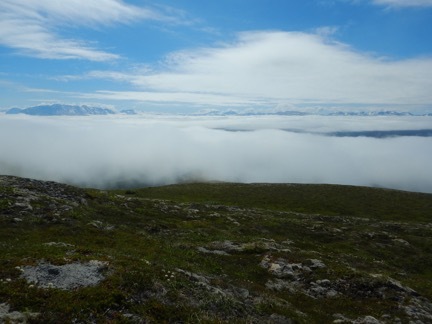 Within an hour, most all of the clouds had faded and the full view of Katmai’s wilderness opened before me. Dumpling Mountain is a place where anyone can experience a world of change. Insects and climate will continue to shape its habitats. Daily weather patterns help to paint the scenery in different light. Flowers burst with color then quickly fade after pollination. Each time I hike it, I get to see a different side of the mountain, so to speak. Oh, that was so lovely, thank you! Thank you for the jurney. Another great blog Mike. I always wondered what the hike up the mountain was like. Thanks Mike for the hike up Dumpling. Love it. Now to clean the mud off my boots. Just found this and so glad I did. Beautiful! Thanks! Thanks Mike, for taking us along on your hike up Dumpling Mountain. 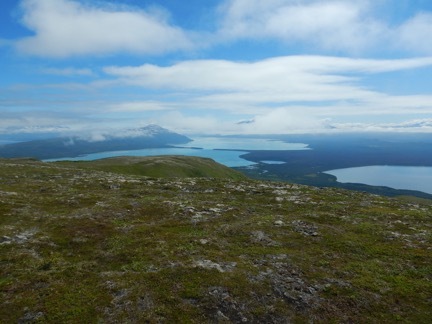 Enjoyed your descriptions and photos of the changing scenery as you ascended Dumpling Mountain, thus showing us a behind the cams view of another grand natural aspect of Katmai National Park and the Brooks River area.